Armed with electric guitars, swooning vocals, and songs that split the difference between rock & roll and dreamy psychedelia, Angela Perley & the Howlin’ Moons pack the biggest punch of their career with Homemade Vision. Like the band’s debut, Hey Kid — an album whose kickoff track, “Athens,” earned Perley an International Songwriting Award in 2014 — Homemade Vision was recorded in the Howlin’ Moons’ hometown of Columbus, Ohio. 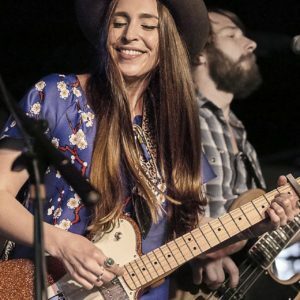 Many of the songs were dreamt up somewhere along the highways and backroads that crisscross America, though, coaxed into life by a group of roots-rock road warriors who regularly play more than 100 shows a year. As a result, Homemade Vision is the sort of wide-ranging record that creates its own geography, building an imaginary place where the influences of David Gilmour, Tom Petty, Led Zeppelin, and Nebula all intersect. It’s also the work of a genuine band. Chris Connor’s guitar playing — a flurry of fuzz, crunch, twang and bang — occupies just as large a role as Perley’s voice, while Billy Zehnal’s bass — coupled with cymbal crashes and snare hits from an arsenal of heavy-hitting drummers — glues the mix together. Inspired by love, heartbreak, and everything in between, Homemade Vision is a battle cry from a band that’s spent years fighting the good fight, carving out their own brand of atmospheric, aggressive Americana along the way. “Ghost” from the album Hey Kid (2014).